Sound and Vision is the media institute of the Netherlands, for individuals and professionals. It is one of the biggest media archives in the world: from radio, television and written press to gifs, games, websites and objects. Besides an archive, the Netherlands Institute for Sound and Vision is also a museum with an interactive media exhibition for all ages and an intensive public programming. It also functions as a learning institute which objectively maps the Dutch media landscape and approaches current developments from a media historical perspective. This way Sound and Vision shows what impact the media has on everyone’s life. The Netherlands Institute for Sound and Vision is the leading institute for media. To fulfil this position, the institute wants to publish and share high-end online stories about media, by which they’re not only showing to be abreast of the time, but also ahead of it. By telling and distributing guiding and directive stories in existing formats, but also in new forms. Sound and Vision claims an active role within the contemporary media culture with this new storytelling platform. The target group of the platform is everyone with an above average interest in media and a high media usage (from newspapers to vlogs, from television to games and web). The primary focus is on millenials (18-36). Using the new storytelling platform we tell stories about media that fit the media usage of nowadays (snackable, mobile, visually appealing). We want people to really read, watch and listen to the stories. We created an innovative way to tell stories, in both content and form. Using a system of vertical cards, from which we can build custom stories. TILT is a storytelling platform about (old, new, future) media, using the newest of media technology and possibilities. We designed millennial proof: specifically for short attention spans (snackable format), in vertical orientation (no need to turn your phone), using a no-scrolling, but swiping interaction, and making use of visual language and visually appealing images (Instagram worthy). With the possibility to decide the length of the story, but also the form (audio or transcript or both), using interactive polls and questions, and a snoozing option (send me a reminder). TILT has been designed with two important target audiences in mind. The user (focus on millennials) and the editors. For the user the content of the story is the most important, the stories can be read with as little distraction as possible in a natural and mobile friendly way. The editors need the freedom to create and tell any story possible with any type of content that exists. 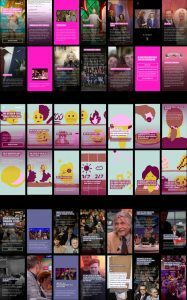 Therefore we applied the following principles: all cards (for example video, audio, text, poll) can be combined into one story, all titles and texts are scalable in size and for each story two primary colours are defined based on the main story image. This way each story has its own look and feel but all stories are connected in design by means of font, icons and visual elements.